Ok, Ok, so I'm not best 'blogger' or 'husband' or 'engineer', but I know how, how much (sometimes), when and what to drink. And sometimes I know how to grow things, like hops. I've currently got eight hops plants starting to sprout in my backyard, and if you've ever seen my backyard, you might be impressed. I've got two Cascades, two Chinooks, one Willamette, one Magnum, one Liberty and one Centennial. Last year was the first year in the ground for the Magnum, Liberty and Centennial so I might see some yield from them this year. I had bought these for the in-laws a few years back and they've been in pots up until last year. Funny, these three are actually doing better than my others that have been in the ground for three years. So as I'm stringing up the hemp rope for the hops to grow on I realize that I'm standing on an old metal chair that's on a an uneven rock path. I'm glad I didn't fall, I'd be screwed, the wife is out of town and the dog can't pick up the phone to dial 911. He lacks the thumbs you know, and his English is terrible. Growing a hop plant is probably as easy as growing tomatoes, basil or a chia pet. All you need is dirt that gets sun, water and a hop rhizome. They'll grow like weeds and require a little maintenance throughout their growing season and they'll have to be trimmed back at the end of the year, circa November. If you're a homebrewer, you'll end up with a buttload of hops to make an interesting beer and if you're a normal person you'll be a homebrewers best friend. So give it a shot if you're the growing type, it's super easy and you're almost guaranteed to be the only one at work growing hops. Weirdo. 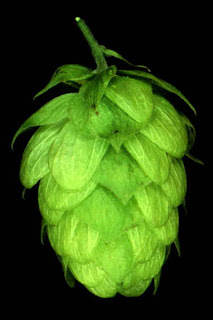 Do you have an online resource recommendation for growing hops?